This exhibition is located in the Gallery at Ace Hotel New York, 20 W 29th St, New York, NY 10001.
Who plants, harvests and prepares your meals? And afterwards, who does the dishes? Since 2012, fast food workers across the United States have been demanding a living wage through the Fight for $15 campaign, echoing the struggles of the United Farm Workers of America who, since the 60s, have led efforts to organize agricultural workers. The Black Panthers, understanding that food is an essential prerequisite for liberation, started the Free Breakfast for School Children Program which remains visible today in free breakfast programs at public schools across the country. Similarly, liberation movements around the world — from Angola’s Movimento Popular de Libertação to the Chiapas-based Zapatistas — have mobilized citizens to take control of their food production systems. 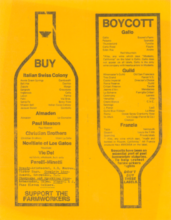 Interference Archive’s exhibition, Fair Food Nation, explores the intersection of local, national and global food issues through a presentation of archival ephemera documenting food’s integral role in the pursuit of social, racial and economic justice. Interference Archive is an all-volunteer, collectively run archive of social movement ephemera. Their work manifests beyond their open stacks archival collection to include publications and public programs, all of which animate histories of people mobilizing for social transformation and encourage critical and creative engagement with the rich history of social movements. Their labor, financial support and collection development are community supported. A reception will be held on Thursday May 11th from 6:00 – 8:00. RSVP encouraged, but not required. Gallery video appears courtesy of Frieze. Additional thanks to media partners, Food Book Fair.